The 5th Circuit Court of Appeals has upheld a District Court ruling that Mississippi’s ‘stop notice’ law violates due process and is, therefore, unconstitutional. The opinion written by Judge Carl E. Stewart, states “[t]he Stop Notice statute is profound in its lack of procedural safeguards.” Unless there are changes to the current stop payment law or the United States Supreme Court agrees to consider this issue, there will be no “lien rights” for first-tier subcontractors. In the meantime, subcontractors may want to seek legal counsel concerning how to address stop payment notices that were to be filed or have been filed and to determine other remedies that may be available if their prime has failed to make payment. Know who you are dealing with. Get 2 or 3 estimates and compare materials, service and guarantee, not just price. Ask for and verify references. Read and understand the contract and guarantee. Get a written estimate and contract. The contract should include a written description of the work to be done, and the price of labor and materials. The guarantee should describe what’s covered by the guarantee, for how long and what the company will do to honor the guarantee. Keep downpayments reasonable. Never pay the entire amount in advance. Ask for receipts and avoid paying cash. Don’t make the final payment until all the work is completed and to your satisfaction. Don’t fall for high pressure tactics or promises to return and take care of final details. It may be difficult to get the company to return once the job is paid for. 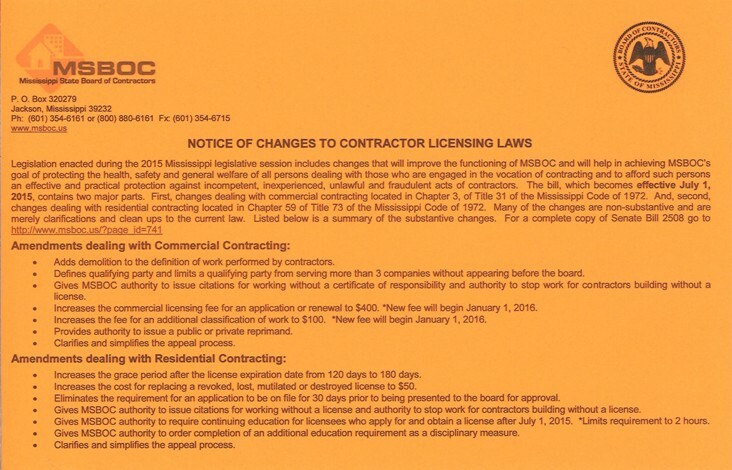 To verify whether a contractor is licensed, contact MSBOC at www.msboc.us or by calling 1-800-880-6161. 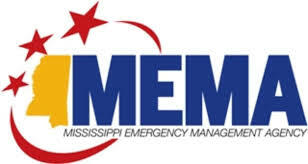 Mississippi Severe Weather Preparedness Week has been declared for February 4 – 8, 2013. MSBOC encourages individuals to prepare for the upcoming severe weather season. Tornados, flooding rain and hail can wreak havoc on homes and businesses. If you are the unfortunate victim of severe weather, be sure to use a licensed Mississippi contractor to make repairs to your home or business. Use the SEARCH CONTRACTORS feature to verify a contractor’s license. For more information, e-mail us at info@msboc.us, or call us at 601-354-6161 or (800) 880-6161. 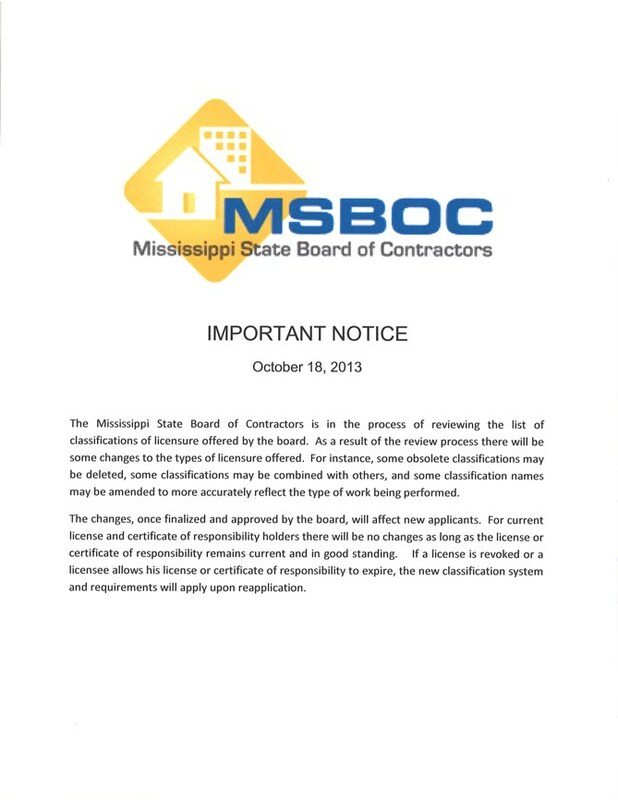 The Mississippi State Board of Contractors has proposed a rule requiring general liability insurance for residential builders and remodelers. The proposed rule was filed with the Mississippi Secretary of State in accordance with Mississippi Administrative Procedures Law requirements. The effective date of the rule is January 25, 2013. All residential builders and remodelers will be required to show proof of general liability insurance after January 25, 2013. An applicant for a residential builder or remodeler’s license, or renewal thereof, shall provide a copy of a certificate of insurance evidencing current coverage for general liability purposes. 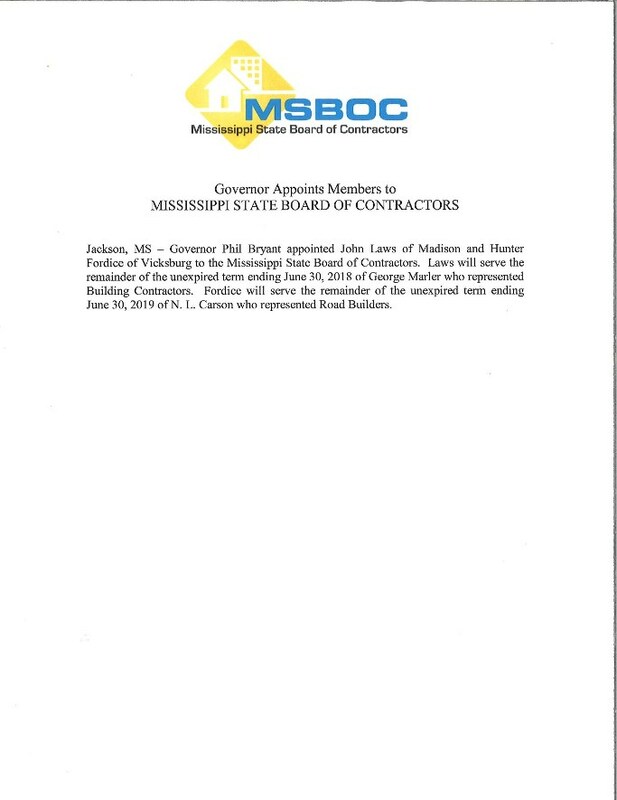 The Mississippi State Board of Contractors shall be listed on the policy of the insured to be notified if there is cancellation of coverage. Liability insurance shall not be required for inactive licensees. 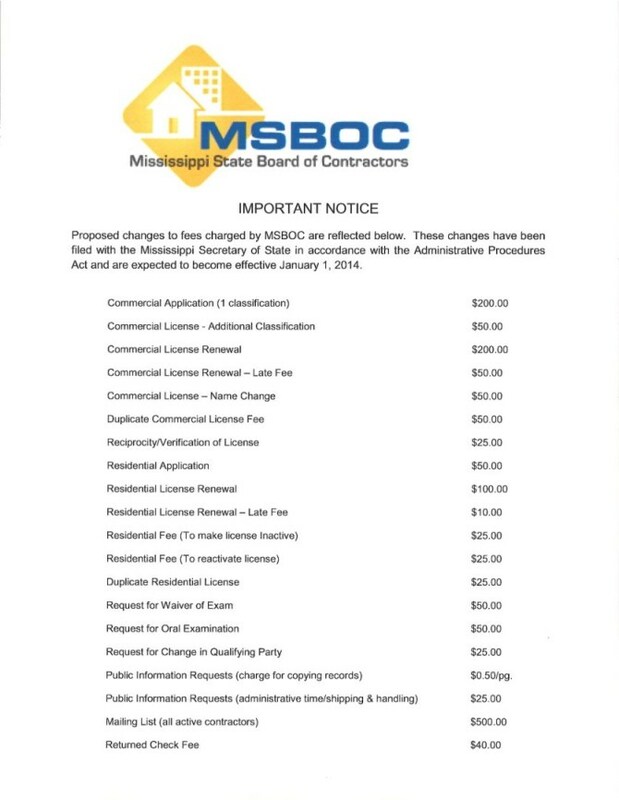 For more information e-mail us at info@msboc.us or call us at 601-354-6161 or 1-800-880-6161. Senate Bill 2533 amends portions of the residential building code and provides the authority for the Board to require liability insurance as a condition for licensure for active licensees. It also clarifies some of the exemptions provided in Miss. Code Ann. §73-59-15. Senate Bill 2233 amends the definition of major structural defect as well as the six (6) year time frame for the home to be free from major structural defects as provided for under the New Home Warranty Act . Previously the six (6) year time frame ran from the warranty commencement date. Now the six (6) year time frame runs from the completion date. Senate Bill 2622: This act requires contractors who submit bids for public works project utilizing funds received by state or local governments following a federally declared disaster to submit along with their bid information regarding the number of vacant positions the contractor needs to fill as well as requiring the contractor to review individuals submitted by the Mississippi Department of Employment Security before hiring individuals who are not submitted by the department. Senate Bill 2651: This amendment approved by the Governor requires the Building Code Council to furnish a report to the legislature on or before December 1, 2012 to be considered during the 2013 regular session that provides findings and recommendations for building and construction standards as the mandatory statewide minimum code. Senate Bill 2902: This act requires contractors to obtain an endorsement or other written signed authorization of every co-payee on a multi party draft. Failure to do so may result in a fine of up to Five Hundred Dollars ($500.00). House Bill 1301: This amendment to Miss. Code Ann. §85-7-185 approved by the Governor provides a right for a subcontractor supplying labor or materials to receive a copy of the bond from the owner or contractor upon request made to the owner or contractor.